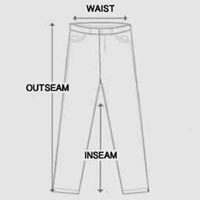 Black Slim Fit Jeans With Double Waist. You’ll turn heads in our double-waisted black slim fit jeans for men designed with the illusion of two jeans layered on top of each other. Black lace-up jeans feature a two-tiered waist system over slim-fit legs made from a comfortable stretch cotton blend. Outer waist has a five-pocket design with a faux leather, lace-up fly alongside an exposed zipper fly, metal circle pocket studs and belt loops. Inner waist includes the standard button fly and additional belt loops. Back pockets are adorned with faux leather panels, slanted zipper detail and logo embroidery. From its studded pocket to leather accents, these mens black slim fit jeans are a unique take on biker jeans that’ll boost any moto outfit.